Facebook says it has closed down numerous pages and accounts for posting spam aimed at helping Brazil presidential candidate Jair Bolsonaro. Social media platform Facebook has closed 68 pages and 43 accounts linked to a marketing group believed to be promoting the chances of Brazilian right-wing presidential candidate Jair Bolsonaro. Facebook issued a statement saying it had acted against the pages and accounts linked to Raposos Fernandes Associates (RFA) "for violating our misrepresentation and spam policies." "The people behind RFA created Pages using fake accounts or multiple accounts with the same names," and then "used those Pages to post massive amounts of clickbait intended to direct people to websites that are... ad farms," added the statement. It insisted that the pages and accounts were deleted for posting spam rather than because of "the type of content they were posting." O Estado de S. Paulo newspaper reported 10 days ago that the RFA accounts formed a massive network of support for Bolsonaro, who faces leftwing candidate Fernando Haddad in a second round runoff on Sunday. 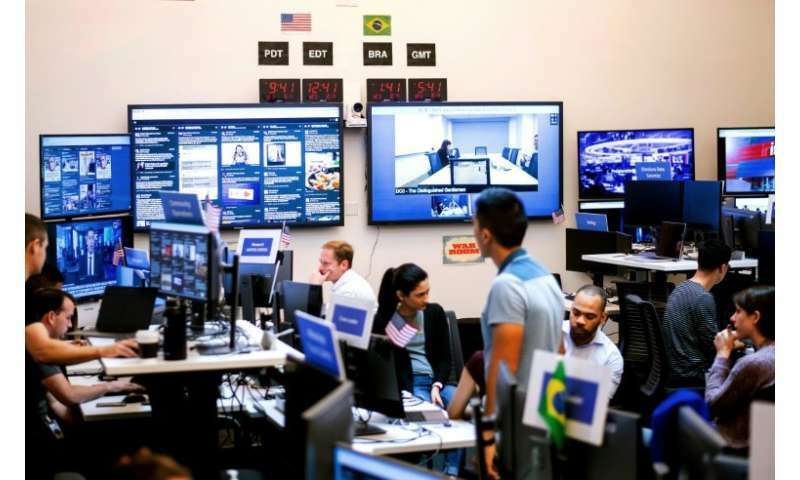 Those pages generated 12.6 million interactions during the month leading up to the newspaper's article, O Estado said, far more than the interactions recorded by international superstars such as footballer Neymar. Having taken top spot with 46 percent of the vote in the first round of elections just over two weeks ago, Bolsonaro leads Haddad by 18 points in the latest polls, thanks in no small part to an impressive social media presence. Unable to campaign since the beginning of September when he was hospitalized following a shocking public attack in which he was stabbed in the abdomen, Bolsonaro has conducted almost his entire presidential bid online, where he has 14 million followers across Facebook, Twitter and Instagram, compared to just 2.8 million for Haddad. Last week, though, Folha de S. Paulo newspaper claimed millions of pro-Bolsonaro WhatsApp messages had been sent out just before the October 7 first round of elections with the complicity of various businesses. If proved true, that would be a crime as businesses have been banned from financing electoral campaigns since 2015. Brazil's top electoral court and the federal police have opened an investigation, while Haddad has called for Bolsonaro to be disqualified. But the rightwing candidate's loyalists have also accused Haddad's Workers' Party of publishing false information during the often bitter and polarized campaign.